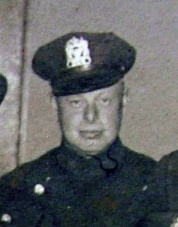 Patrolman David Frost was killed when his motorcycle was struck by an automobile. Patrolman Frost was traveling east on Sunrise Highway when a west bound driver attempted to turn into a gas station near Huntington Road. As the driver crossed the east bound lanes on Sunrise Highway he struck Patrolman Frost's motorcycle. Patrolman Frost was thrown from the motorcycle and instantly killed. Patrolman Frost had served with the Lynbrook Police Department for five years and previously served for one year with the Rockville Centre Police Department in New York; he was a member of the Lynbrook Volunteer Fire Department and served as chief for two years. Patrolman Frost died one day short of his 34th birthday. He was survived by his wife and two daughters. You will not be forgotten! Your memory lives on in Lynbrook!